A negligent pet owner has been given a ten-year ban for allowing kittens to starve to death – but she can keep her dogs. Michelle Smith, 36, failed to provide an adequate diet, environment and veterinary attention to the cats and ducks which were kept in a filthy caravan. Smith, from Aberchirder, Aberdeenshire, appeared at Aberdeen Sheriff Court on February 5, and admitted to five counts of animal neglect between July and August last year. She was given a ten-year ban on owning and keeping animals, excluding dogs, with a further sentence deferred for six months. A rabbit hutch containing three dead “emaciated” kittens and eight thin and hungry ones was found at the property. Also within the caravan, there were seven ducks, eight hens and two dead ducks – and Smith admitted that one of her dogs had attacked them earlier that day. The horror find was discovered after a good Samaritan called a hotline and tipped off inspectors. Scottish SPCA senior inspector Alison Simpson, said: “After receiving a call to our animal helpline regarding welfare concerns I arrived at the locus and was met by three dogs. “I noticed a residential caravan which was not used as a residence but rather had cats in pens at the rear interior. “Opposite the house, I saw a rabbit hutch where kittens could be heard. “I first asked Smith if I could look in the rabbit hutch where I heard the kittens, it was a two-story hutch and stank of faeces and urine. “The kittens were clawing and climbing at the mesh front. Alison added: “Within the hutch, there were eight small kittens alive, around four or five weeks old, all were extremely thin, dirty and wet. “There were also three dead kittens which appeared to be emaciated. “After removing the kittens from the hutch and placing them in my van we then entered the caravan and the stench and presence of cat urine and faeces was overwhelming. There was no food or water available for the cats inside the caravan. Alison said: “On initial inspection of the first caravan room and the seven cats inside they were all noted as being underweight, some severely, and there was evidence of chronic eye issues, gingivitis, ear mites and varying degrees of matting or build-up of faeces. “The deceased kitten was in an extremely emaciated state. “Within the second room of the caravan, there was another deceased kitten. “This room was in a similar state to the first room in the caravan, with faecal matter covering the room and cats. Once the vet had examined the kittens, they had to be removed from the rabbit hutch. 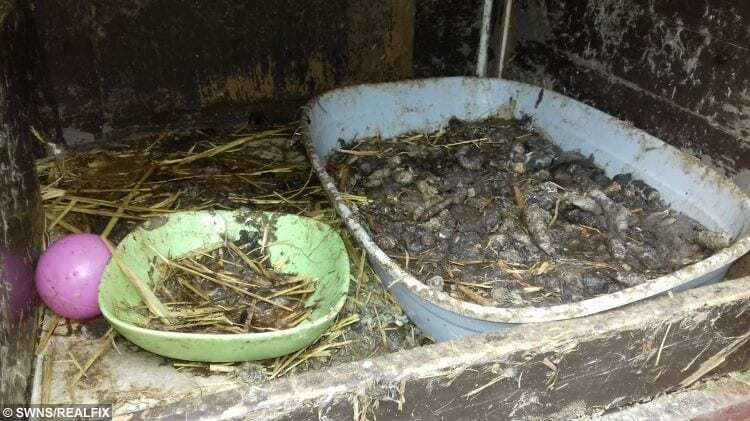 Alison said: “Once the vet had examined the kittens which had been removed from the rabbit hutch they were found to be in poor body condition and covered faeces and urine. “The kittens all had dirty ears and ear mites. “All poultry examined at the locus were significantly underweight with two being deceased. Two of the hens were quiet, and hunched over, indicating illness. “The vet believed the birds had not had their nutritional requirements met for a minimum of seven days. She added: “This is a shocking case of neglect which did not happen overnight and could have been easily avoided.